This wine is now sold out. New Vintage arrives March-April 2014. It’s a right old Cairanne! And this really is anything but. Not old in anyway and very fresh and exciting, this lesser known Cotes de Rhone Village is very much treading its own path into the new age of wine growing in France, where wines that sell at that optimum price point, £10-14, really are shining through. 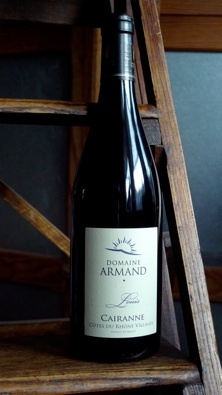 I tasted this wine with Audrey Armand on that sun blessed evening on the 27th July 2011 and thought it was exactly what I wanted in a top quality Rhone, that doesn’t have the price tag of some of the better known appellations a little further south but most definitely has the quality. This wine is made from older vines, Grenache, Syrah and Mourvedre. If you can, decant and leave for an hour. This is a Special cuvée – limited production wine. 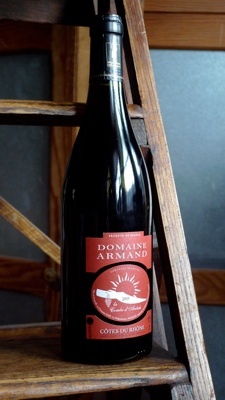 AOC Côtes du Rhône Villages, Cairanne , Cuvée LOUIS red 2009. Terroir: hill side limestone. Old vine Grenache, 50%, 25% Syrah, 25% Mourvedre. Hand harvested and selective picking. De-stemming, long maceration, aged in oak barrels that are two years old for 6 months. This wine has a deep red purple colour, the nose is intense and complex, black pepper, mineral and after breathing we discover ripe aromas of cherry and coulis sauce with light toasted notes. In the mouth this wine has a well balanced structure, powerful with fruit flavours and elegant tannins with a long finish with some light vanilla showing through. Can be aged for up to 6 years and drinking beautifully now. 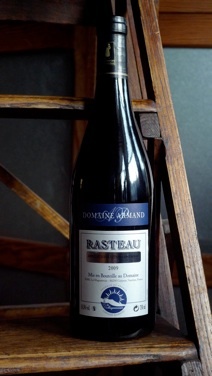 Something has always excited me about this name: Rasteau! It evokes a slightly mischievous thought, I guess because the name sounds a little like rascal. Anyway, although not a picturesque as Sablet, up on the hill a few miles away, this little town is just as famous for great wines! Incredibly excited about my first Cote de Rhone! Yeah! We are making giant strides! 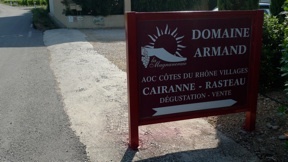 I searched one frantic afternoon in the summer of 2011 for something good and found Audrey and Domaine Armand on a 40 degree centigrade afternoon on the 30th July 2011! Hand harvested and selective grape picking. The wine has a deep cherry red colour, brilliant and clear. The nose is very intense with ripped fruit aromas and a note of leather and Kirsch. In the mouth the structure is very round and soft with a very good concentration of spices, liquorice and fruits, with a fresh final finish. Pleasant to drink now or can be aged for 2-3 more years. I have always found Rhone wines exciting: the complex blending of varietals I imagine has something to do with it. Also, what I like about the Rhone is that generally the quality of the wine is solid. I am very rarely left leaving Rhone feeling disappointed, Cote Rotie, maybe being the one exception. So it was a plan to find some wines that were a little different and as always with a Whirly wine, made with some passion. 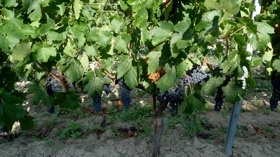 The estate Armand’s Vineyard exists for more than 80 years. In 1990, Jean-Paul ARMAND, Rosie ARMAND and their son Patrice set themselves up as the EARL “La Magnaneraie”. 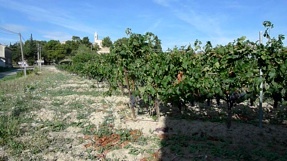 In the course of generations, we have preserved the vineyard and contributed to its extension. It stretches now over 35 hectares. We began in 2002 the creation of the chai (cellar). In 2003 we carried out our first vinification, with 200 hectolitres; the rest of the production had to stay in the cooperative, waiting for the shares’ expiry. The production for 2003 was of the order of 12,000 bottles. In 2004 the entire production 1,500 hl is stored in our Chai and we are able to expand our range of wines. The great diversity of the estate’s soil allows us to make wines with different labels and to guarantee our wines typical characteristics. In 2004 the production is of the order of 27,000 bottles, divided in four labels.